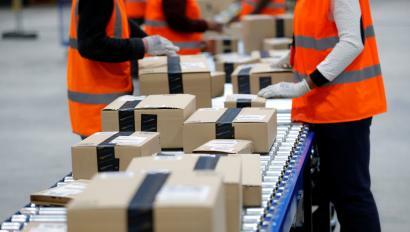 Amazon is staffing up for the holiday rush with around 100,000 additional hires. As big as that number sounds, it’s actually fewer people than the e-commerce giant added in either the 2016 or 2017 holiday seasons, when it brought in 120,000 additional workers. Citi analyst Mark May says he thinks the reduction in seasonal hiring is strong evidence that Amazon is succeeding with plans to automate operations in its warehouses. “We’ve seen an acceleration in the use of robots within their fulfillment centers, and that has corresponded with fewer and fewer workers that they’re hiring around the holidays,” May told CNBC on Nov. 2. He added that 2018 is the “first time on record” Amazon plans to hire fewer holiday workers than it did the previous year. Amazon bought robotics company Kiva Systems for $775 million in 2012, and began using its orange robots in warehouses in late 2014. By mid-2016, it had become clear just how big a difference those robots were making. The little orange guys could handle in 15 minutes the sorting, picking, packing, and shipping that used to take human workers an hour or more to complete. In June 2016, Deutsche Bank predicted Kiva automation could save Amazon nearly $2.5 billion (those savings dropped to $880 million after accounting for the costs of installing robots in every warehouse). The success of robots thus far may also have contributed to Amazon’s Oct. 2 decision to raise its minimum wage to $15 an hour for all US employees, affecting around 250,000 full-time employees and 100,000 seasonal workers. That move is less financially risky if Amazon sees itself rapidly replacing these human workers with robots and other automated systems. In an Oct. 15 research note, Morgan Stanley analyst Brian Nowak was optimistic about Amazon’s ability to offset higher wages through automation. Nowak noted that Kiva robots were already enabling smaller Amazon warehouses to handle the same capacity as other centers, and leading to a drop in fulfillment costs. “We think improved fulfillment efficiency is set to offset the aforementioned wage increase,” he wrote. In other words, the 2018 holiday season could be a harbinger of what’s to come.